World's most efficient HRV (heat recovery ventilation) delivers a 7 year payback compared with 50 years for "always on" ducted systems. Creates dwelling Zones with external quality air, nearby rooms are ventilated to these zones, toilet smells are extracted externally. 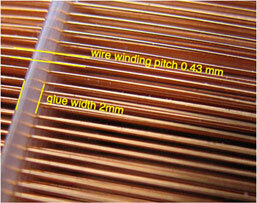 Eliminates €50/annum Filters costs, Eliminated Ducts reduce fan pressure drop losses by 70%. Fans independently adjust to maintain heat exchanger efficiency, improving performance by 10% over HRV with equal fan speeds. Gases equalise rapidly in still air ensuring Humidity and CO2 arrive at the FreshR unit quicker by air than through ducts. 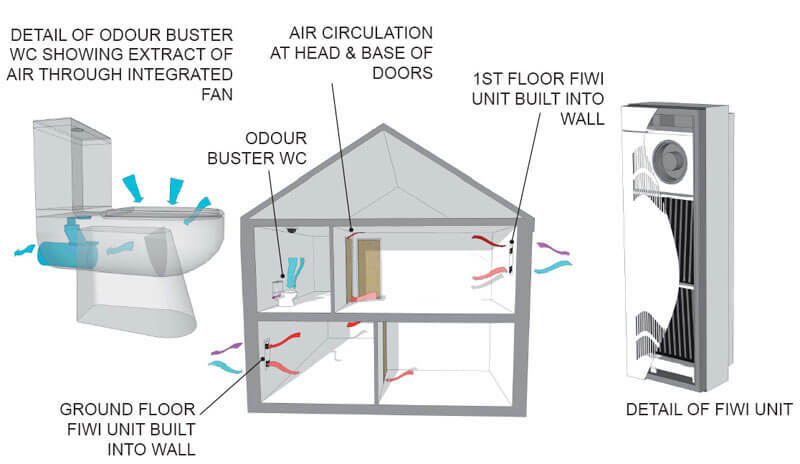 In a 200m2 house, ducted HRV has annual running costs of €120/annum, for 2 FreshR units its €5/annum. In a 200m2 house, ducted HRV has ventilation heat-losses of €250/annum, with 2 FreshR units its €50/annum, only occupied spaces are ventilated. CO2 and Humidity monitors constantly check air quality and adjust fan speed accordingly. Fits discreetly into the external wall, its polypropylene shell eliminating cold bridges. Very quiet - 25dB @50m3/hr and 30dB @100m3/hr and low fan power consumption puts it on top of the SAP list. Uses the world's most efficient fine-wire heat exchanger, its 15 times more powerful than a standard plate heat exchanger. A 200m2 Passive House without HRV has 5,500kWh ventilation losses, always on ducted HRV reduces these losses by 3,500kWh, costs €96/annum to run and €60/annum for filters. This leaves €200/annum savings to pay back the €5,000 capital cost plus mortgage interest leaving a payback of 40 years. It probably needs replacing every 25 years!. 2 Breathing Windows in the 200m2 house reduce the ventilation losses from 5,500kWh/annum to 500kWh/annum because unoccupied areas aren't ventilated, because they're always balanced and because the powerful heat exchanger is 16 times more efficient. There's no filters and the combined running costs of 2 units is €5/annum. This leaves €500/annum savings to pay back the €2,000 capital costs leaving a payback on investment of 4 years. Jon Kristinsson and Eur Van Andel invented the Breathing Window in the early 90's, Jon also built the world's first 185 Rotterdam Passive Houses in 1980 with the world's first HRV and insulated foundations, 12 years before Wolfgang Feist. Jon measuring these 185 Passive Houses for 5 years and realised that "the heat-loss from the houses was equal to the heat-loss through ventilation", to reduce this he spent 10 years searching for the best heat exchanger in the world and eventually found the fine wire heat exchanger in the Van Andel workshop, 40km from where he lived. Passive House's normally have ventilation heat losses of 15kWh/m2.annum, the Breathing Window reduces ventilation running and heat-loss costs by 10kWh/m2.annum, so Jon has achieved his goal! Intelligent controls with CO2 and humidity monitors continually balance fan speed for optimum efficiency, compensating for wind speed and air quality, this improves the heat exchange efficiency by a further 10%. (In a Canadian ducted HRV field study, 46% had unbalanced supply and exhaust air flows), so the BW only starts when stale or humid air is detected, this ensures optimum air quality and eliminates unnecessary ventilation heat losses. Centralised HRV systems use filters to reduce dust and grime building up in ducts, but often the pipes between the filter and the room remain dirty! (In a UK study only 10% of HRV owners changed filters, a Dutch Health Dept HRV spot check showed 52% had dirty filters). 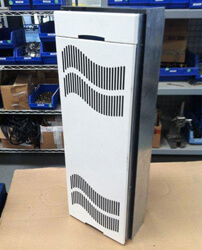 The BW combines the best heat exchanger in the world, with the most efficient EC fans in the world, with intelligent controls that constantly adjusts fan speeds, add in its ability to only ventilate occupied areas and it becomes something remarkable. Filters are not necessary in the BW but can be fitted if required, however note that despite 15,000 HRV units being sold in the UK in 2010, only 2,000 filters were sold in 2011. Naturally occurring filter blockage, which increases over time, causes fans to automatically increase running speed to maintain volumes of delivered air. Most people don't notice this until their electricity bill arrives. With a breathing window, you can simply remove the FiWi heat exchanger and place it in the dishwasher, shower, or just hoover the dust out. It couldn't be simpler. Any condensate occurring in the system automatically drains to waste, so you never have to worry about condensation build-up. Removal of odours in bathrooms is easily taken care of with humidity/motion activated fans with actuators. 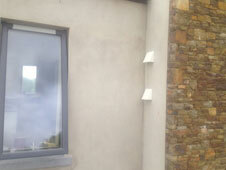 The slim-line design of the breathing window means it can be installed into the wall with just a sleek panel visible. This panel is easily opened for maintenance and cleaning. 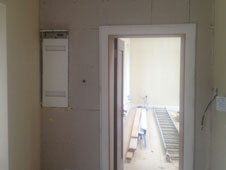 Behind this door, the smart controls of the system monitor the temperatures of the 4 air-streams in the unit. The system will always run itself to maintain the highest level of efficiency while ensuring CO2 and humidity levels are regulated using sensors for each. When CO2 reaches 650ppm or humidity reaches 45%, the unit automatically slows down to trickle speed until levels become higher again. At 50m3/hour, the breathing window emits just 23dB of sound, while at high-speeds of up to 100m3/hour this increases to just 30dB. This is normally indistinguishable from normal household background noise. Breathing Window. 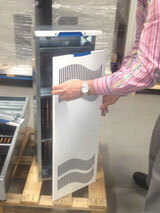 The future of Passive House ventilation. 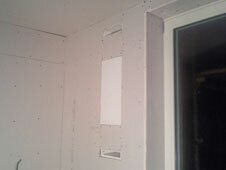 Cross ventilation above and beneath doors is crucial in all Passive Houses with ducted HRV, and often under-estimated at the design stage, not so with the Breathing Window. With subtle architrave ventilation detailing, threshold gaps and ventilation grills in bedrooms to cross-ventilation zones, we ensure gas equalization throughout the building, with typically 2 units acting as the lungs of the house. One unit running at medium speed (100m3/hr) provides enough fresh air for 4 people (Passive House requirement are 25m3/person.hour). 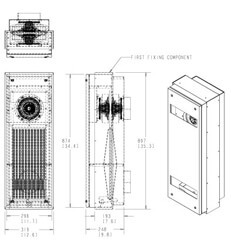 A fine-wire heat exchanger has 15 times better heat transfer efficiency compared to standard flat plate heat exchangers giving the breathing window much higher system efficiencies. In delivered volume comparisons, the breathing window has 60% less pressure drop in the system caused by ductwork used by other units. This results in lower fan speeds, greater efficiency and greater savings. Due to the small dimension of the heat exchanger and the rapid temperature drop over 16mm, most moisture leaves the building as saturated vapour, which means less frost occurrence and less defrost cycling compared to standard units of similar efficiency. A FiWi unit tested in Iceland had a 95% lower defrost cycle rate than standard HRV units. 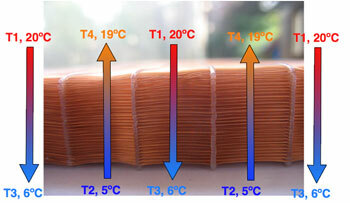 Standard HRV systems suffer from high thermal resistance at the exchanger surface due to the boundary air layer. 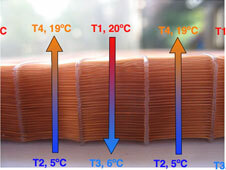 As heat is exchanged by the copper wire in our FiWi exchanger, the boundary layer has little or no effect on heat exchange, increasing efficiency. 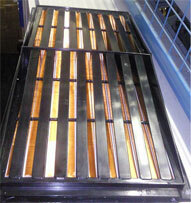 Our competitors often rely on heat loss from inefficient fans to boost their efficiency figures. Our high-quality fans lose very little heat, and yet we have still measured 93% heat-exchange efficiency in an installed unit in a house in Dublin. At -10 degrees outside, a breathing window was measured supplying fresh air of 18 degrees to a building at 20 degrees. This could be increased to 95% by weaving the wires closer together but the pressure drop through the heat exchanger increases cancelling the gains.